it’s tomato season! fresh, ripe tomatoes are in their prime, popping up in gardens + farmer’s markets, making appearances on seasonal menus + even inspiring an entire festival. as a tomato-lover + someone who grows tomatoes, this makes me very very happy. 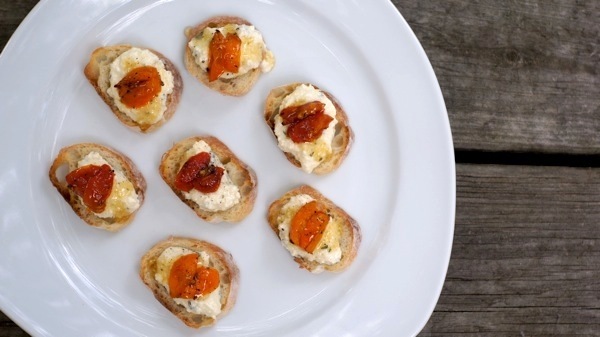 when i saw this recipe for honey-roasted tomatoes + herbed ricotta on crostini, i leaped to try it + am thrilled with the results! the honey-roasting brings out a wonderful flavor in the tomatoes, which works perfectly with the creamy, herbed ricotta + the crunch of the crostini. i used two types of tomatoes to add variety in color + flavor, + both turned out beautifully. the coolest thing about this recipe? all ingredients were locally-grown or locally-made. the crostini are from our local bakery, the tomatoes were grown on a tennessee farm, + the oregano came straight out of our own garden. pretty neat, huh? for the recipe + a review of the cookbook it came from, quick-fix southern: homemade hospitality in 30 minutes or less, hop over to cooks + books + recipes, where i’m guest posting today! Yums McGee! Herbed ricotta? Love, love and love. not just Yums McGee, also Delish McTastyson =)! the herbed ricotta is great by itself too, or could be incorporated into lots of tasty pasta dishes! I was just looking for appetizer ideas for our cookout this weekend and I had not found anything yummy enough yet. I think this will be the one! thank you ,thank you, thank you! you’re welcome, you’re welcome, you’re welcome! =) let me know how it turns out for your party! Honey-roasted! Never heard of that, but it sounds fantastic! i had never heard of either, but i could see how the caramelized honey would work perfectly with the sweet tomatoes + creamy, herby ricotta. it works perfectly! What a fantatsic appetizer for a party or just for an evening at home! Actually, they look os good I could make a meal of them! Great idea for these tomatoes I’ve been getting – thanks! you are so welcome! i hope they turn out as deliciously for you as they did for me! Those look gorgeous, Amy!! Great job! thanks, kristen. the colors of the local tomatoes are just so vibrant + pretty! Honey, honey roasted tomatoes sound amazing! 😉 Seriously. With ricotta. To die! thanks, honey! 😉 they were delicious! Great looking appetizers with some of my favorite ingredients! thanks, alison! definitely some of my favorite ingredients, too, especially in the summertime. I’m addicted to tomatoes now–these look divine! you + me alike — i feel like i’ve been incorporating fresh tomatoes into every meal i make these days. i’m loving fresh summer tomatoes! Such a simple and delicious appetizer. Love the idea of honey roasted tomatoes! the honey works perfectly with the tomatoes – gives them a caramelized, but not overly-sweet flavor. i was impressed!